Russian scholar and editor; born Dec. 9, 1854, at Kovno, Russia; went when very young to Jerusalem, where he still (1904) lives. Luncz, who has been blind for many years, has founded, in conjunction with Dr. Koisewski, an institution for the blind at Jerusalem. In the exploration of the Holy Land, Luncz has rendered great services from the historical, geographical, and physical standpoints, through his guide-books for Palestine, his Palestine annuals, and his Jerusalem almanac: (1) "Netibot Ẓiyyon we-Yerushalayim: Topography of Jerusalem and Its Surroundings" (vol. 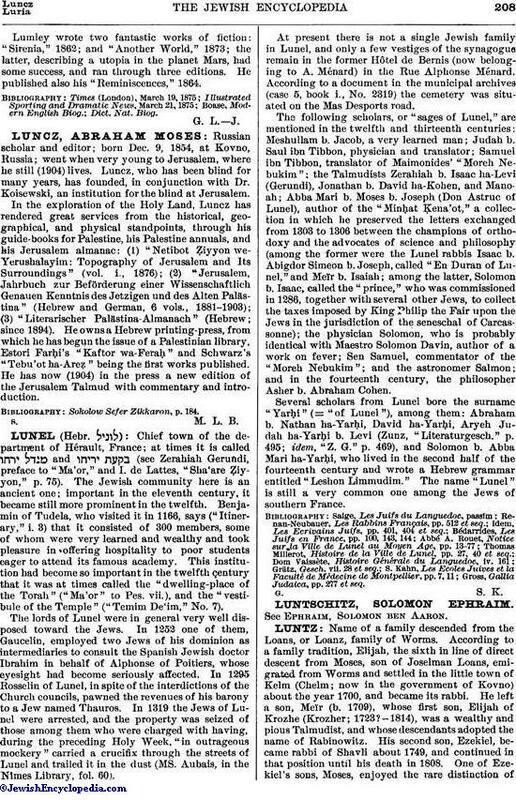 i., 1876); (2) "Jerusalem, Jahrbuch zur Beförderung einer Wissenschaftlich Genauen Kenntnis des Jetzigen und des Alten Palästina" (Hebrew and German, 6 vols., 1881-1903); (3) "Literarischer Palästina-Almanach" (Hebrew; since 1894). He owns a Hebrew printing-press, from which he has begun the issue of a Palestinian library, Estori Farḥi's "Kaftor wa-Feraḥ" and Schwarz's "Tebu'ot ha-Areẓ" being the first works published. He has now (1904) in the press a new edition of the Jerusalem Talmud with commentary and introduction. Sokolow Sefer Zikkaron, p. 184.